Discussions of film, television and popular media. Tien-Tien’s paper is available for download here. Please email either Jenisha [jenisha@uchicago.edu] or Panpan [panpan@uchicago.edu] for the password. 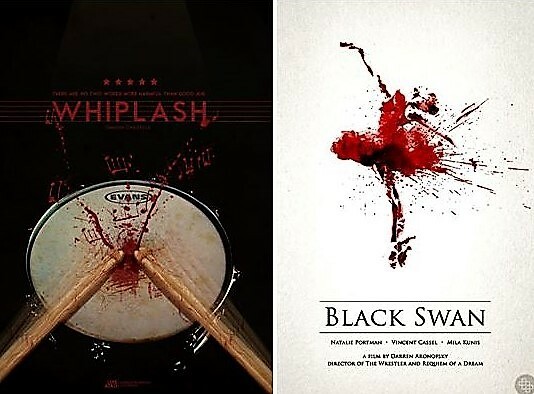 Damien Chazelle’s Whiplash (2014) and Darren Aronofsky’s Black Swan (2010) are two recent examples of films about musicianship and dance which focus signs of artistic achievement on the tortured site of the performer’s own body. The protagonists of both films—teenage drummer Andrew Neiman (Miles Teller) in Whiplash and prima ballerina Nina Sayers (Natalie Portman) in Black Swan—push their physical and mental well-being to points of rupture and exhaustion in the pursuit of “perfect” performances, and both films take uneasy stances towards these ambitions, alternately portraying them as heroic and beautiful, or selfish and monstrous. The model for the “perfect” performance in these genres always precedes the individual performer who will interpret the part, and it is always a model which the performer is meant to tirelessly chase after during rehearsal time. The contradiction lies in this pursuit—while the measure of greatness is clearly defined in these forms and can thus (at least theoretically) be recognized as such once it is achieved, the form also contains the impossibility of its own fulfillment, for the “perfection” in these models is a mechanical rather than human ambition. Whiplash and Black Swan both raise the question of what the role of human action is in the performance of a work of art, understood differently as the “humanness of art or desired lack thereof.” What meaningful interventions can a human performer make onto the overdetermined forms (classical ballet, conservatory music) in which a standard for excellence pre-exists the performer? What are the goals for improvisation and interpretation in these restricted contexts, and what are the merits of a controlled performer versus a performer who can “let loose” on stage? Tien-Tien Jong is a PhD student in the Department of Cinema & Media Studies at the University of Chicago. She holds a BA in Film & Media Studies from Dartmouth College, where she wrote a thesis entitled “This Waking Dream We Call Human Life: Ballet, Opera and the Unconscious in Musical Film.” Her research interests include melodrama, dance films and musicals, non-fiction and essay films, and the history of automatons.